I need to use transactional tables in Hive, so I naturally use the ORC format. One limitation of those transactional tables is that they have to be bucketed (in Hive 2 at least. In Hive3 my understanding is that bucketing is not mandatory, but the default is equivalent to having 1 bucket). Buckets are something that should be done for a concrete problem not just because you think you should have them. Normally I would not use them. Which is not helpful when you actually have to use them. So how to use buckets? 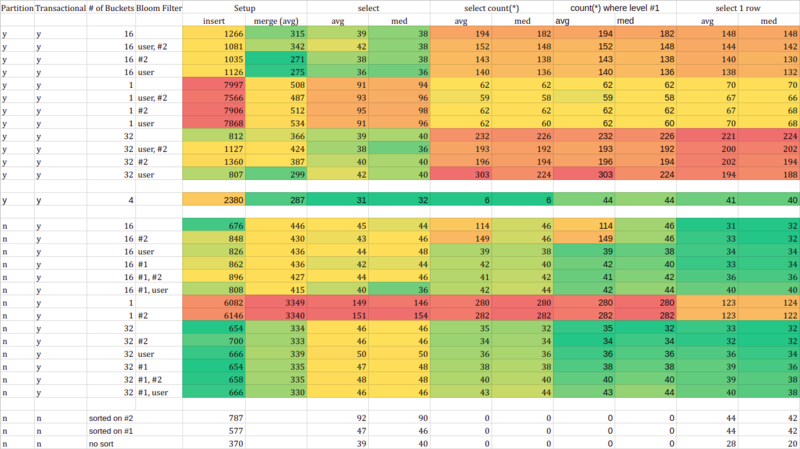 1B rows table worth 3 months of data, with a compound (logical) key: user id, and 4-level hierarchical identifier. This is about 15GB (unreplicated) on disk. big select with join on 2 other tables, resulting in 400k rows. All benchmarks were run 5 times, doing one iteration for all tables before starting the next iteration to prevent caching. bloom filters on levels #1 and/or #2 my hierarchical key and/or on the user id. I added as extra test some non-transactional tables, sorted on different fields. It is tricky to properly display the data here so I show it as an image (click to enlarge), but you can find it as a pdf: ORC Benchmark – results or see it on google sheets. More buckets would mean more files so faster load and faster queries up to a point. Bucket + partitions would create way too many files, at the cost of performance. Proper bloom filters would make everything faster. the sweet spot (for me) is partition + 4 buckets. I am very disappointed because I had a lot of hopes for bloom filters (I guess there is something I am doing wrong). The rest is more a confirmation of my expectations, with numbers to prove them. The worst of all? My sweet spot is the one I am already using, so after all those tests (which ran almost 3 days straight) I have no new information to speed up my queries. Well, the silver lining is that at least I have data to show that I can pat myself on the back. Cluster on which I tested: hdp 2.6, hive 2, 8 data nodes (8 CPU, 32GB) on AWS, doing nothing else apart from running these tests.